I hope you will forgive me for this sad post. I have been worried about animals for a long time, and now is the time I would like to share my grievances with you to see if together we can make the pain stop. I truly believe we live in a time where more than ever we can make a difference to the world just by sharing and taking action, however small. Last time I wrote about the Tara Bodong foundation, a few very motivated women who are helping the Tibetan families and girls who live as outcasts in the province of Arunachal Pradesh, an area where no one can come without permission. This time I wish to share my thoughts with you about the needless suffering to animals. Victor told me about some movies that have been circulating on Facebook about dolphins being slaughtered in Japan and on the Faro Islands. 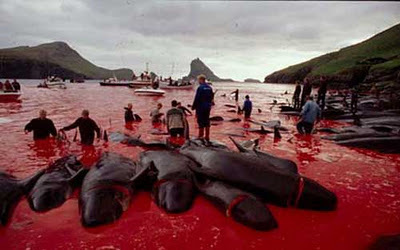 On the Faro Islands the people kill hundreds of dolphins (grinds) in a yearly festival. The animals are wounded and slaughtered in a brutal way. The Islanders, however, believe they are keeping the Viking tradition alive in this way. The bay turns red with blood and the animals are extremely frightened. The result is a grim and desolate landscape of dead dolphins. When Victor told me about this, he was very emotional. I think it is absolutely wrong to hurt animals in this way. The movie The Cove which won an Academy Award in 2009 has brought this bloody drama to the screen, I have yet to see it. Seashepard is trying to do something about this barbaric and needless slaughter. This organization was founded by Paul Watson in 1977 and aims to save the life in our seas and ocean. They have started a campaign to stop the bloodshed. Please spread the word so that we can hope to do something about this. Dolphins are lovely creatures, incapable of hurting anyone or anything. They are highly intelligent, communicating by sonar, and live in social groups. When I lived in La Jolla, we saw many dolphins whilst kayaking. I felt a strong sense of life and beauty when I saw them. That why it pains me so much to see them being hurt in this way. Please spread this post to anyone you can to tell them: yes we can do something about the suffering.